The results of the 2018 University of the Philippines College Admissions Test—popularly known as UPCAT—will be released by the end of the month, according to UP Vice President for Public Affairs Jose Dalisay Jr. 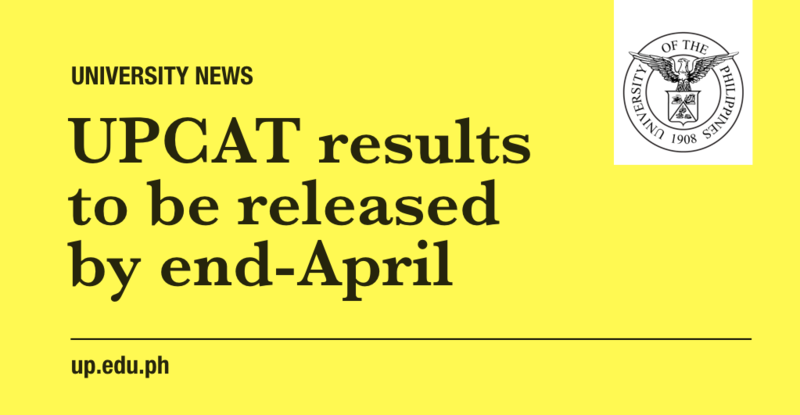 Responding to mounting inquiries and complaints from the public about the reported delay in releasing the exam results, Prof. Dalisay cited an earlier statement by the Office of Admissions giving a range of March to April for the timing of the release. The UPCAT is taken yearly by graduating high school students in the Philippines seeking entry into the national university. More than 103,000 applied to take the exams last October, out of whom more than 80,000 actually took the exams. Of these takers, some 14,000 will be accepted into one of UP’s eight constituent universities, for a passing rate of about 17 percent. Under UP’s complicated but well-studied admission rules, the results of the UPCAT exam itself make up just 60 percent of an applicant’s University Predicted Grade or UPG, an assessment of the student’s likelihood of succeeding in UP. The balance is made up for by an averaging of the applicant’s high school grades, plus a small plus or minus to encourage economic, social, and geographical diversity. Dalisay revealed that about 60 trained staff members are working overtime to get the results out soon. Aware that other universities are already requiring nonrefundable deposits from prospective students also awaiting the UPCAT results, Dalisay explained that “Unfortunately we have no control over the academic calendars of other schools, and cannot be rushed by those calendars. On the other hand, if the students can wait and do get into UP, they can look forward to many years of quality, tuition-free higher education.” UP shifted to a new calendar two years ago, with first-semester classes opening in August. UP was recently ranked 156th among Asia’s top 200 universities, according to the Times Higher Education survey, largely on the strength of its research citations. While it has applied a socialized tuition scheme for many decades now, UP led other state universities and colleges last year by implementing full free tuition ahead of the signing of the Universal Access to Quality Tertiary Education Act or the free tuition law.